If you’re setting up an exhibition stand at an expo or trade show that will be held at a high-end hotel, convention centre or shopping centre, then it is very important that the decor you use for your booth should fit its surroundings. Your decor has to be elegant and professional. Otherwise, your booth will look cheap, and your target audience will associate inferior quality with your products and services. You wouldn’t want that, would you? One solution that will help you avoid that and impress your audience with the quality of your display is by using a well-made fitted tablecloth. 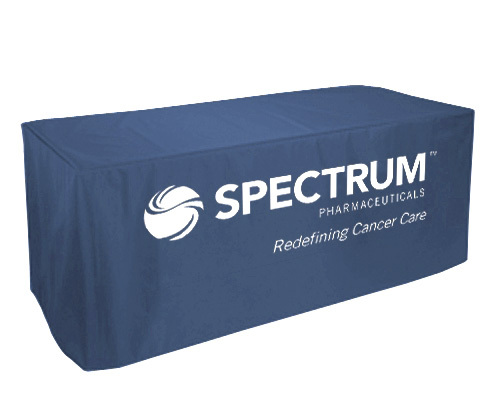 We have high-quality 6ft fitted logo tablecloths that will help you. Why should you use fitted trestle table cloths to cover your tables at your exhibition stand? The simple reason is this box style of tablecloth doesn’t have billowing drops. Thus, its lines are cleaner, straighter and more elegant. Moreover, it will stay in place because it fits to the table, and so you can be sure that your display will look neat all the time. Why use our table cloth? This particular table cover has an image and a block-colour background. The image can be your corporate logo or any picture you want. You can provide us with the design for the printout, or we can create the layout for you. The simple design makes a striking statement, which is an effective advertising tool for your company. Moreover, our table covers are made from high-quality materials and using a state-of-the-art printing process. The fabric we use for making these covers have a thickness of 210gsm. It is thicker than most table cloths offered in the market today. Additionally, we use dye sublimation to print on the fabric. Dye sublimation printing is the most accurate and detailed printing process available in the market today. Dye sublimation utilises high levels of heat and pressure to create images. In this process, the image is printed in its mirror likeness on a piece of thermal paper. The paper is then pressed onto the fabric using a machine. The heat and pressure coming from the machine changes the ink from solid to gas and becomes embedded in the fibres of the fabric itself. The resulting printout is not only sharp, detailed and richly coloured. It is also permanent and damage-proof. The table covers we offer are truly of high quality. And it is quality you can definitely afford and even save money on. For one, we don’t have escalating rates depending on the number of colours to be printed. Our fabric covers already come out of the printing process in full colour, and we don’t charge extra for that. For another, we don’t require a minimum number of table covers per order. If you need just one tablecloth for your display, then you can buy just one from us. Because dye sublimation printing has made the printout permanent on the fabric, it will not fade away. So you can use this table cover as frequently as you want, and in different events as well. You can even wash or dry clean it without worrying about fading or damage. Another reason why we think you can save on our fitted table covers is we offer colour matching for free. This means you can pick out the shades you want to use, for both the design and the fabric of the tabletop cover itself, from the Pantone colour library. The Pantone colour library is a book that indexes various shades of various colours recognised by the human eye. So, in the instance that you want, say, a red tablecloth, you have to select a specific colour of red – ruby, auburn, lava, crimson, mordant, maroon, red devil, carmine, etc. We don’t sell ready-made tablecloths with block colours. And to make sure that the table cover turns out exactly how you want it, you can request us to do a test print first for you to check. You also get to choose whether you’ll buy a regular, four-sided table cloth or a three-sided, open-backed one. The open-backed option is more convenient if you will have people sitting behind the table. The open backing means these people will have room for their legs under the table without disturbing the cloth. Fitted logo tablecloths are the perfect accessory for your display if you’re going to set up at a high-end hotel, convention centre, or shopping mall. It will add a touch of class and elegance to your display. We deliver to any location in Australia, including Sydney, Melbourne, Gold Coast, Canberra, Brisbane, Darwin, Perth, and Adelaide. Call us to learn more about this product today.